I'm starting a new thread because our issues have drifted from asbestos to a possible leak in our boiler. We have gotten a bunch of solid advice on this previous thread on asbestos removal/reinsulation and the beginning of our hot water troubles. 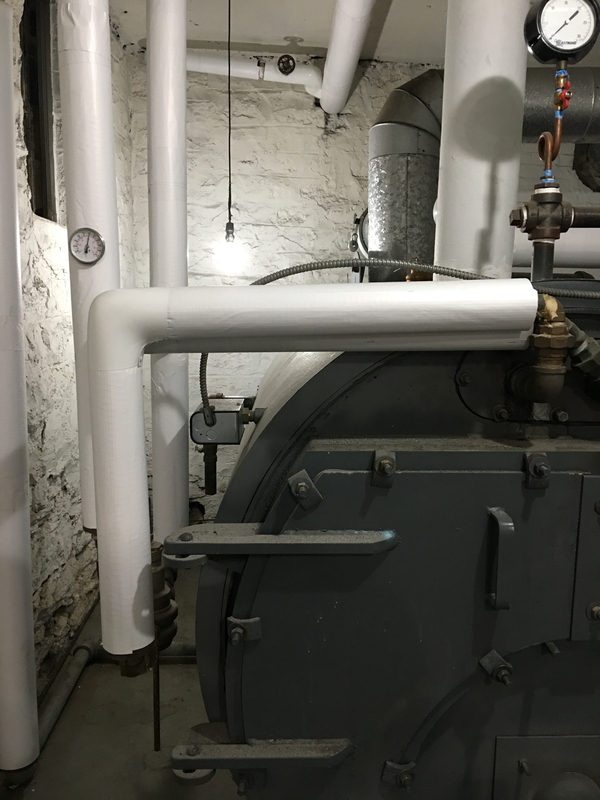 A quick update: We're a 24-apartment coop, oil-fired burner, single pipe steam. We have a fair amount of master venting at 3 locations. 60-70 radiators. 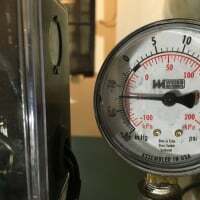 A couple days ago, a boiler technician found that we were losing about an inch of water per hour, by the gauge. His guess was that we have a leak in an buried return. Today, we had a different company come out for a second opinion. They installed a water meter on the boiler so we could see how much we're adding. Our first reading showed 11 gallons in an hour. They looked throughout the basement, examined the pipe that is exposed and looked in other places where the pipe is just below the surface. 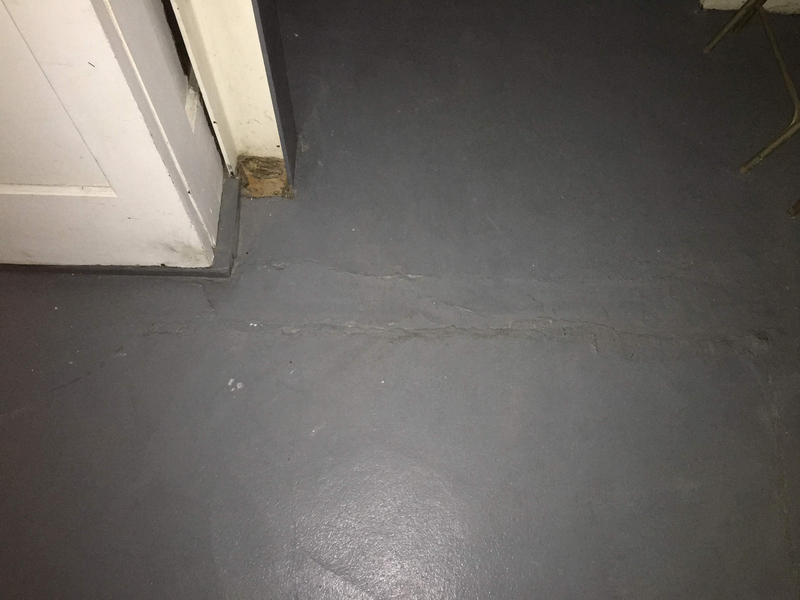 Their opinion was that we don't have a major leak in the returns, because there is evidence that they have been replaced or patched recently, because pipes don't corrode in dirt, because the kind of concrete we have is not corrosive. They recommended we should start by going through each apartment and checking for hissing or spitting vents, or leaking shut off valves. He thinks we could be losing a lot of this water through the radiators rather than through a leak. Does this seem like a reasonable theory? It makes sense for us to go through the buildings' radiators. I just didn't think we would do it in the middle of an emergency hot water/heating crisis. It brings up other questions for me. For example, should I go out tomorrow and buy 50 radiator vents?! A mix of Gorton 4, 5, 6, ...? 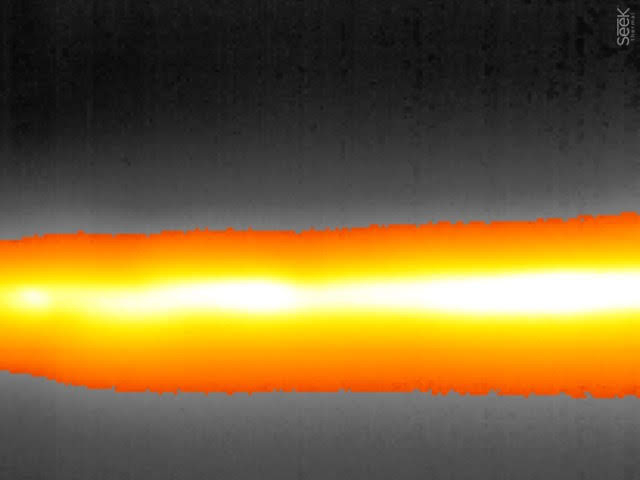 I also just received an infrared camera attachment for my Iphone in the mail today. Over the weekend, my plan is to take photos of the returns in the basement, looking for leaks. We will also test the low water cutoff, on Jamie Hall's advice. Our primary boiler technician is coming back on Monday to see about determining the source of the leak. His strategy would be to add a shut off valve to each branch of the steam mains, then open them one at a time with the boiler running to see which loop is losing water. I may be misunderstanding this strategy. You could be losing steam through leaking valves or vents, though I would be a little surprised if it were that much. Still, worth checking, and fixing anything you find surely won't hurt. I'd also worry some about the boiler itself. While low pressure is generally regarded as wonderful, still there should be some pressure -- and it should build slowly for the duration of a run. The idea of cutting off sections of the system has some merit. A bit drastic -- and be sure the valves put on are full port -- but it might help pinpoint the problem area. I would look in between the patches in the floor for more leaks. It may have been just a spotty patch repair. Whoever said pipes don't corrode in dirt doesn't know what they are talking about. Buried wet returns will corrode and leak. 11 gallons in one hour suggests a major leak. If it is not obvious above ground, it is underground. I'm going to test the low water cut off today. I attached a couple photos of the cut-off. There is a test button and a manual reset. Should I use this or just empty water until it drops below the cutoff? Thanks for the other questions/suggestions. The boiler is building pressure. I have it set to drop into low fire at about 1 pound of pressure right now. Wondering if I should run it at higher pressure temporarily? Might that help? I think not. Steam at higher pressure is slower. But all this intake of cold water is confusing. 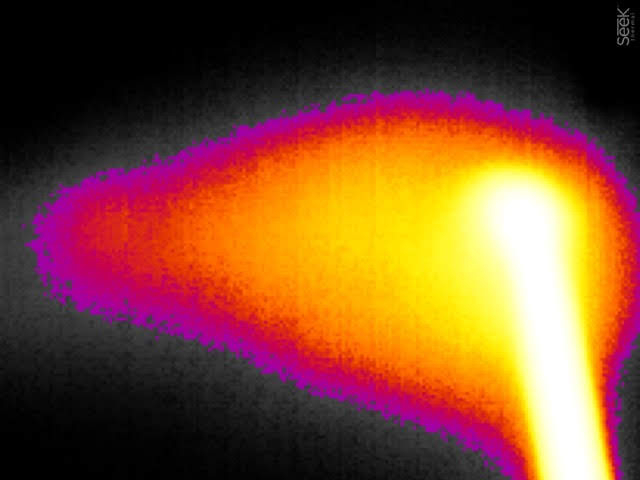 The infrared camera arrived. I'll post photos of the condensate returns later today. I'm hoping we can identify the leaks and schedule a repair next week. Since we now have a meter on the water intake, we're considering raising the water feeder to fill above the coil immediately. This will improve hot water while we schedule the repairs on the returns, right? Our super is filling it manually now and he can't keep up with it. I'm guessing raising the water feeder wouldn't help our heat issues. 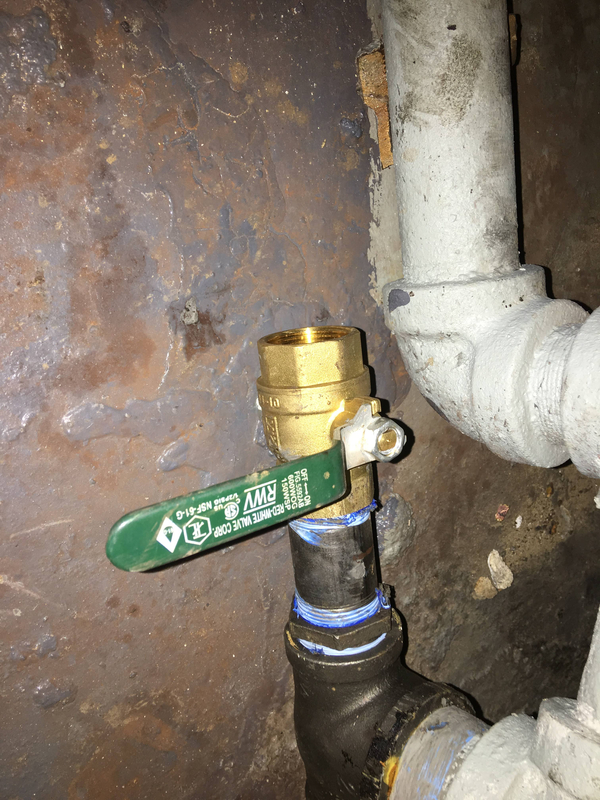 Don't raise the pressure -- all that will do is make the leak leak faster, and I don't think you need that. The best way to check the LWCO is reality -- lower the water level. If it's manual reset, you will have to reset it to make it turn back on when you raise the water again; not a bad thing. And I'd go ahead and raise the water level to where it belongs, covering the coil. Is that a steel fire tube boiler? If so it is a simple matter for someone, who knows what they are doing, to check inside the tubes for water leaks. If some tubes are leaking, they can be plugged temporarily. If the tubes are good and there is no water on the floor or in the fire box, then my bet is on the UG wet returns. 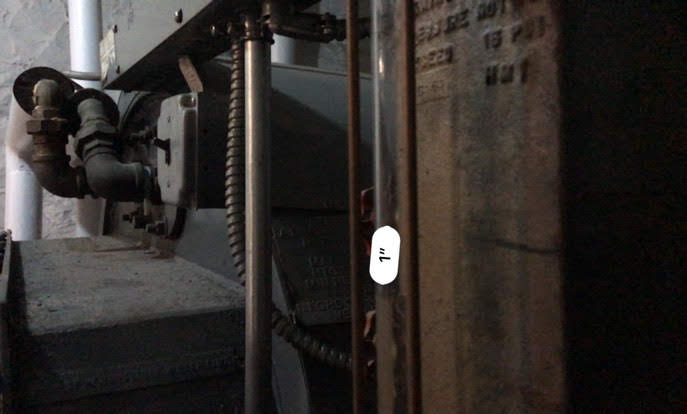 What is in the pit near the boiler? Wet returns can be placed on top of the floor and can go up and down as long as they stay below the water line. Update: I spent most of the day playing with the boiler and looking for leaks. A friend from another coop came to help. LWCO: It works! I think it is the LWCO on the water feeder that shuts off the boiler. The boiler turned on again as soon as I added some water. Fire tubes: Yes, they're steel. 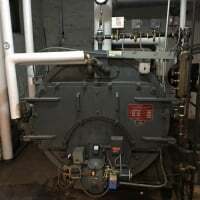 It's a Federal FST-40 Scotch Marine boiler. We're not seeing any evidence of leaking in the boiler. No water on the concrete floor. I'm not sure how to make sure there's no water in the fire box, but wouldn't all the tubes just fill up with water if that were the case? Pressure: I didn't turn it up. It's running at about 1 lb. of pressure. It ran for a few hours on manual as I tried to heat up the building and find leaks. Seemed okay generally. The building did warm up a bit. Meter: I used a stopwatch to time the water intake flow. About 30 sec/.1 gal, 1 min/.2 gal, 5 min/1 gal, 1 hour/12 gal (I love proportional thinking). The loss seems to be about the same whether the boiler is on or if it's off. This would be evidence that the radiator vent theory of water loss is bogus, yes? 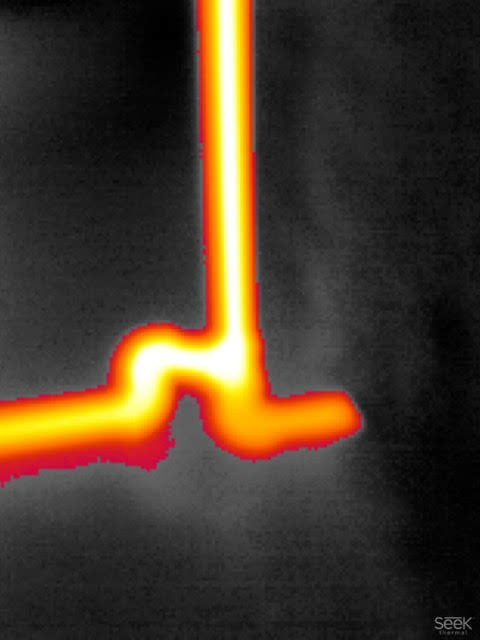 Infrared photos: We took photos around the basement. The first photo is where we think the leak might be. I'm including the other photos for comparison. Is this the leak? 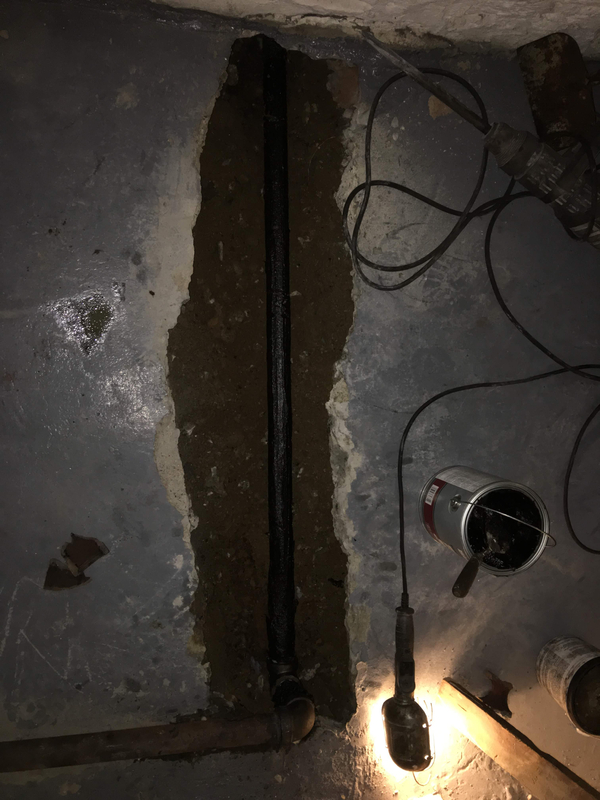 A friend recommended that we might use a masonry bit to drill into the floor a few inches away from where the pipe dives down, careful to miss the pipe. If we can get down to the dirt, we might test for moisture or steam might even come up. This is the other side of the wall where this buried return enters the boiler room. I might try drilling into the floor tomorrow. Also waiting for a boiler technician to return on Monday for his assessment. 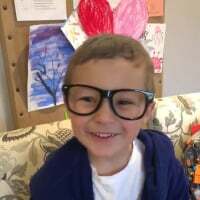 Your first picture looks like a suspect. Just a 1/4" hole on a small drill so as to not go thru the pipe. You hear/feel if you hit pipe or rebar. Moister probe as in plant soil checking might give you some idea. 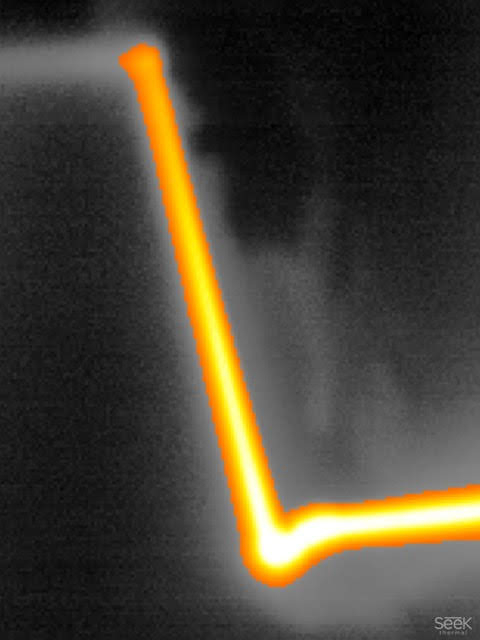 Though another hole where there is no suspect would give you reference on the moister meter. From the "blob" of wet return going below floor, does the pipe have to be buried at that point to the boiler room. It can be thru walls, above the floor with a step over safety barrier where there is foot traffic. If the boiler tech is coming, the fire tubes could be checked easily. The doors swing open, you should have the tubes cleaned and inspected regularly, insurance often dictates a schedule. But as the name implies, fire tubes pass the fire from the burner, small leaks would be boiled away up the chimney. Dollars to donuts your wet returns are leaking. 11 gallons /hr is a lot of water. It would take a big steam leak and that would be noticeable. Thanks, all. Your responses are really helpful. Learning valuable advice with each one. Source of leaks: It has to be a buried return. The rate of loss seems to be the same even when the boiler isn't running. 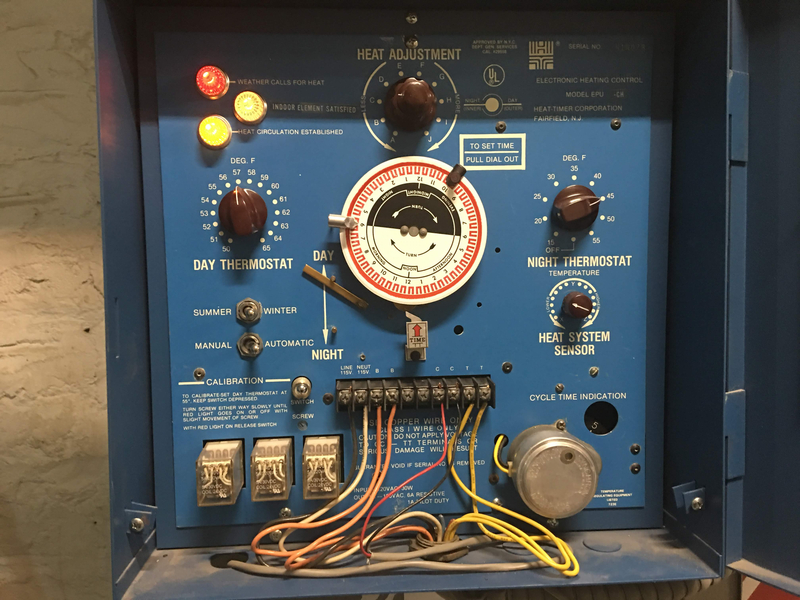 The fire tube idea is interesting and I will ask the technician, but wouldn't we have greater loss during the heat cycle if that were the case? Moisture probe: Thanks for the suggestion of a second comparison hole away from the pipe. Not sure if I'm going to try it yet, but if I do, I'll go slowly with the first hole and stay away from the pipe. I have 20 V/1.5 A impact drill and will use a 1/4" or 3/16" bit. Pretty small, right? 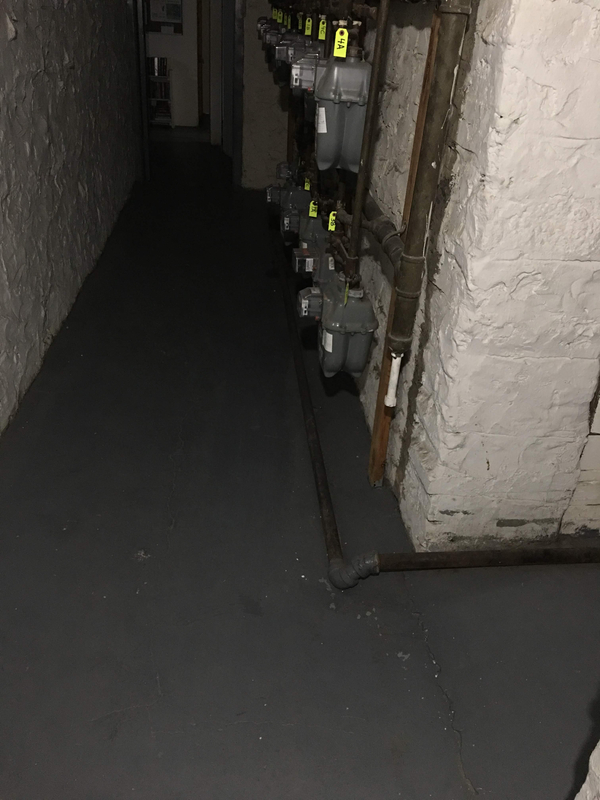 Installation of new pipe: The section where the heat "blob" crosses the main hallway to the back of our basement, storage bins, bike racks, etc. It gets a lot of foot traffic. I don't think a step-over barrier would work. I like the idea of a plastic trough and a cover. Maybe we could drop a heavy metal plate over the top, like they do after street work. Does anyone have a link to the kind of trough that would be used? 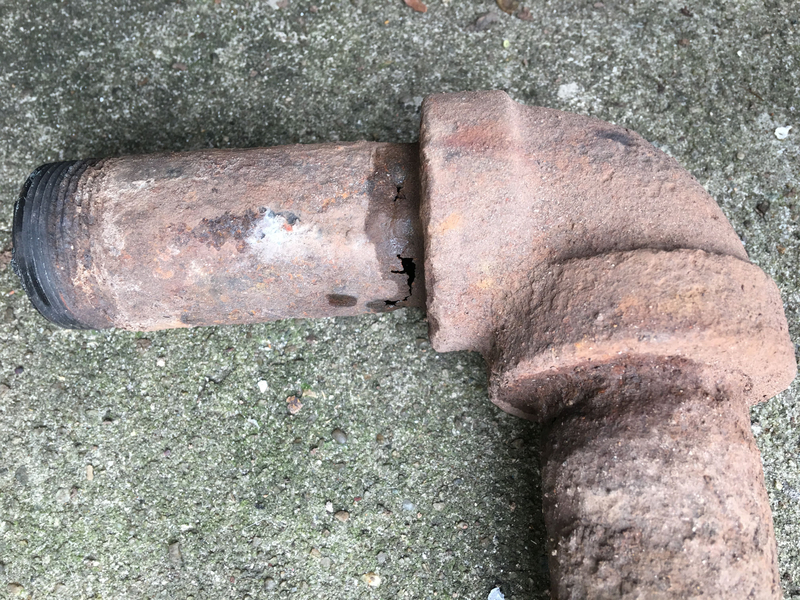 Type of pipe: I've heard that sometimes returns in the dirt are replaced with copper, since it doesn't corrode as easily. Is that true? If we are putting the new pipe in a trough, maybe it's less important. It would be protected from the dirt and available for inspection if there is an issue in the future. 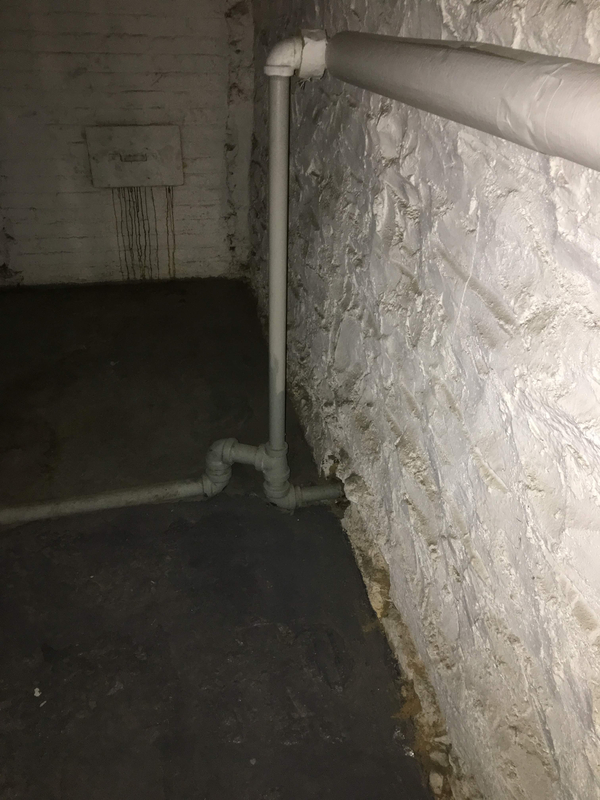 Insulating buried returns: This is a pretty short section of pipe and the returns are not currently insulated on both sides (hallway and the other side of the wall in the boiler room), but maybe we should consider insulating new pipe, assuming this is in fact the source of the leak. What kind of insulation is used on buried returns? My guess is that our boiler technician wouldn't insulate the pipe unless I ask. Sorry, I forgot the mention the suggestion of isolation valves on drips with purge set ups. I'm sorry, but I don't quite understand. Would these be on the wet returns as they come back to the boiler? Inside the boiler room we have two low-lying wet returns coming back to the boiler. We would put an isolation valve on each of those? And it would let us flush out all the sludge that has built up in the returns. I love the idea, just wondering how best to set it up. Is there somewhere I can go to read more or see photos of what this looks like? I can send photos of our setup later. 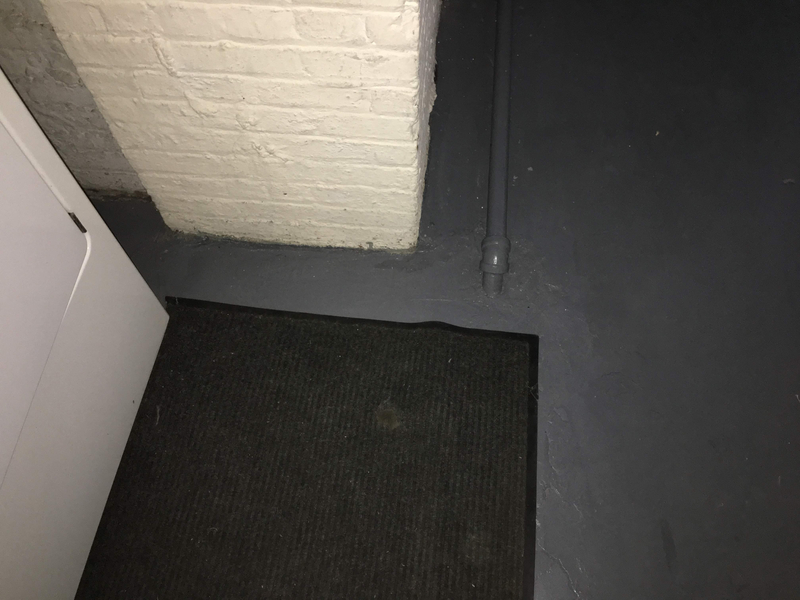 I cant see the layout from here but is there any way of temporally running a 1" hose above the floor or a condensate pump and bypass the underground. Then you'll know! 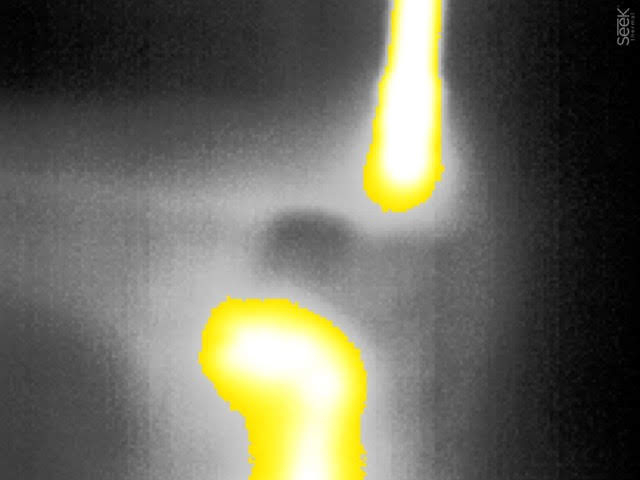 In the first infra red photo which looks like a leak. I can’t believe the paint is not peeling off the floor. With the amount of water being lost I also can’t believe the area isn’t bigger. 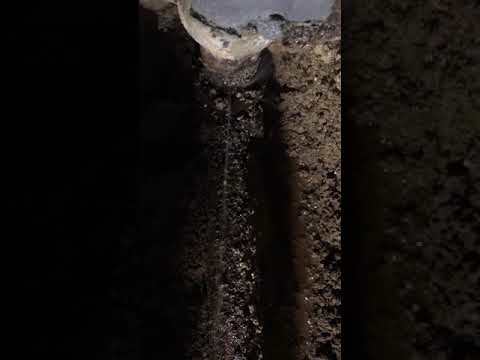 Take a masonary bit drill in away from the pipe. If you hit the subgrade, and bring up mud there it is. The other thing to consider is the integrity of the boiler with that much make up? A temporary hose is an good idea. It would require drilling a new hole in the foundation wall separating the hallway and the boiler room. Maybe too much work for a diagnostic? Yeah, the paint is actually new, though I don't remember flaking before. Maybe I'll post a photo later with actual temperatures of the "blob". So we drilled some 3/16" holes near the temperature blob. Came up with definite signs of water. Wet dirt. A wooden skewer came back glistening with moisture. Not exactly mud, but I was leery of the pipe so I didn't get too close. Seemed enough to say that there must be a problem there. Why would the dirt be wet at all. By the way, I made a visualization to understand how much water we're losing. 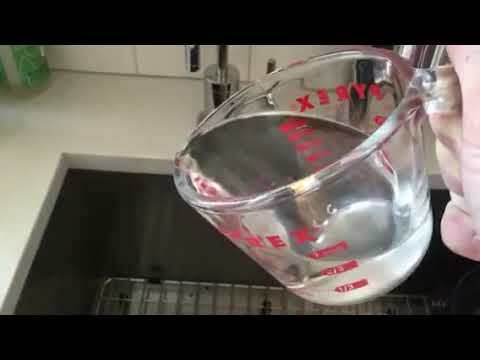 11.25 gal/hr = 1 cup/20 sec. Leak: Our boiler technician came yesterday. I showed him the infrared photos we took and how a wooden skewer in the probe holes in the concrete came back with moisture. 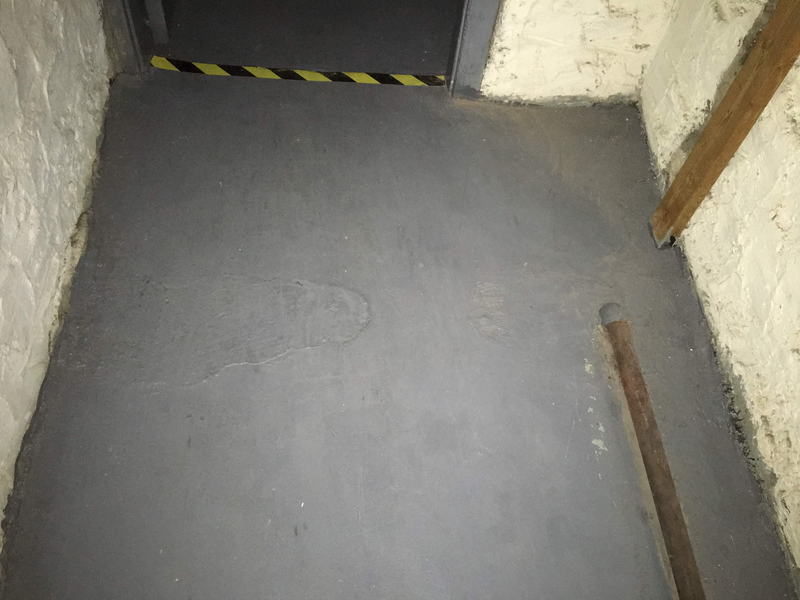 He opened the concrete with a jackhammer and found the leak quickly. 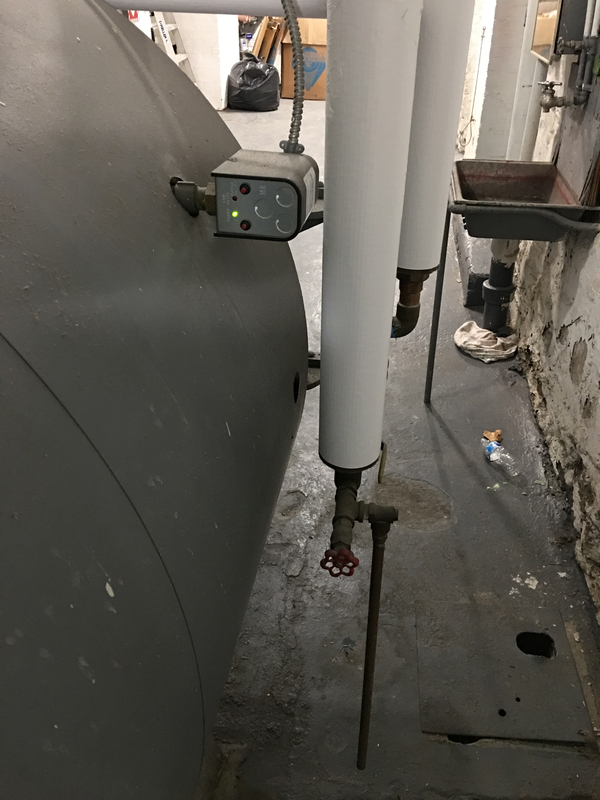 He replaced the pipe and added a valve on the boiler room side so that we can flush the wet return, during the summer boiler cleaning, I guess? 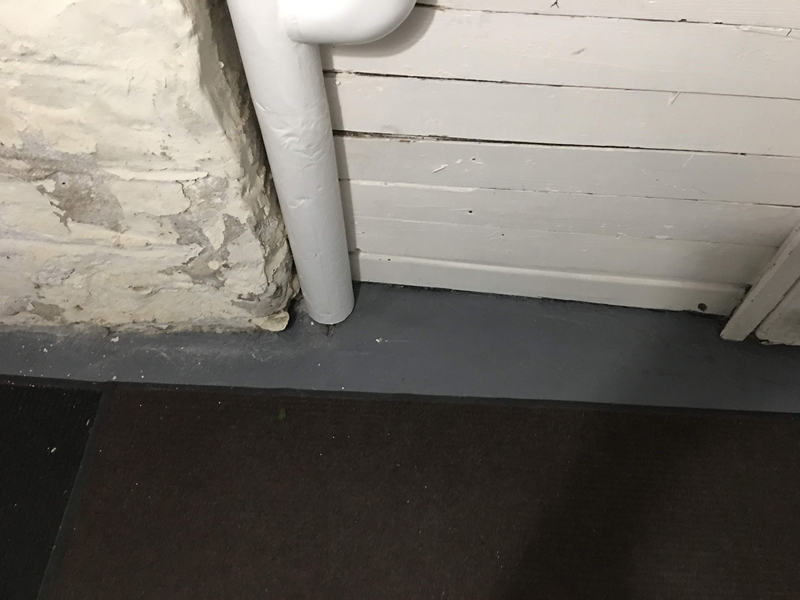 When he installed the new pipe, he covered it with roof flashing cement to waterproof it. I had asked about a plastic trough or sleeve, but he liked this solution better. I don't plan to cover it with concrete again though. It would nice for us to have access to these pipes if there is ever a problem in the future. Instead, we're going to get a piece of steel to lay over the trench. Water feeder: We decided not raise the water feeder. If we don't have a leak, it doesn't seem like it will be an issue. In fact, having it a little lower alerts us when there is an issue. 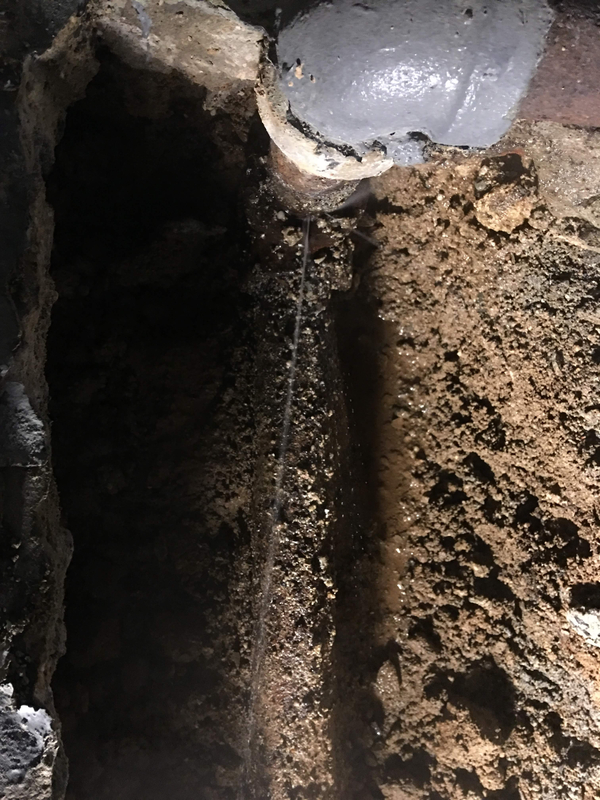 Without it, the feeder could continue pumping water into the system and we wouldn't realize if there is a new leak without checking the meter. I'm going to check this morning, but between 4pm and 10pm yesterday we didn't lose any water. The line in the water gauge stayed the same and the meter didn't move. I'm glad it worked out! Nice little leak you had there, eh? It's been about 5 days since the leak in our condensate return was repaired. All seemed well with the boiler (kicking into low-fire at 1lb of pressure, humming along when I run it on manual) and the hot water has mostly been fine. But yesterday we got a lot of complaints about people being cold. I went down this morning and all seemed fine, except we're running at much higher settings than we used. I looked at logs going back a few years and for outside temperatures like we have now, we used to run at C or D on the Heat Timer. We're currently set at F and people are still cold. Here's my theory for what has happened. Please let me know if I'm off-base. 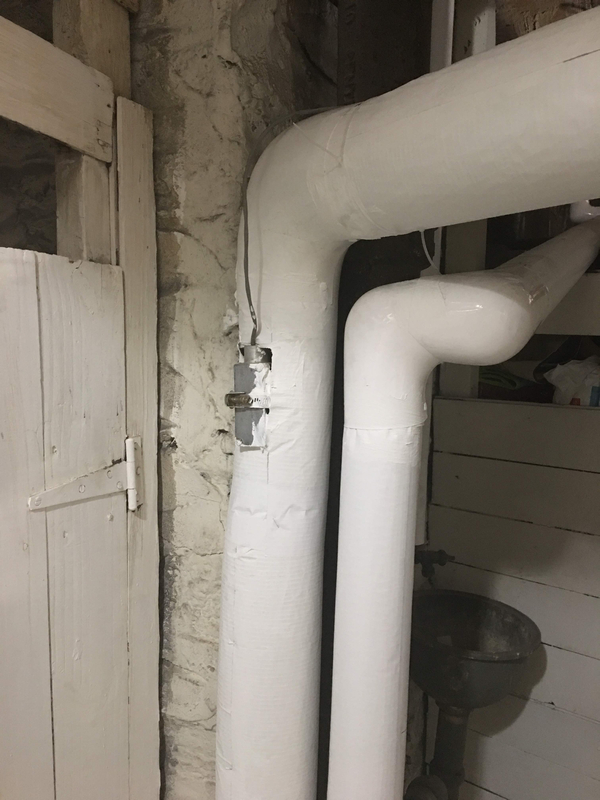 - The insulation team finished yesterday and they did a really thorough job, including insulating all around the return pipe that has the heat system sensor install. 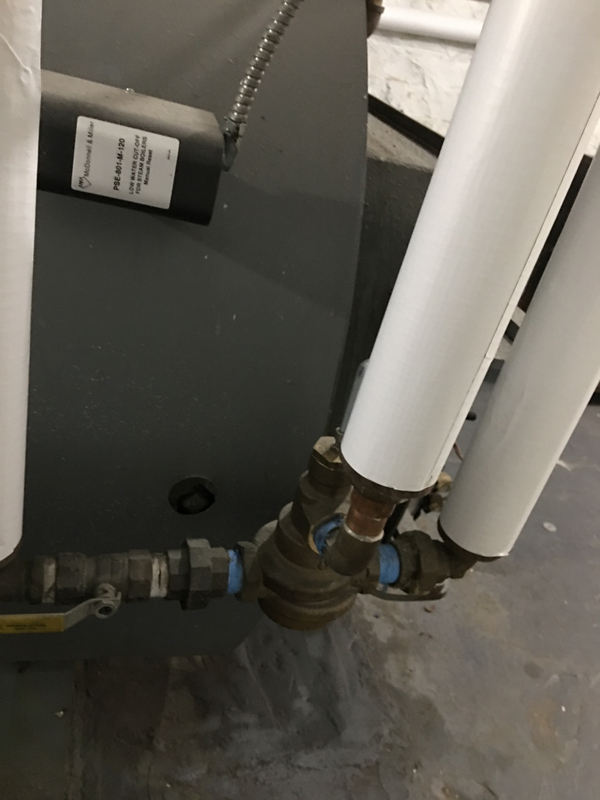 - The return pipe is holding a lot more heat than it used to so it takes less time for Heat Circulation Established to register. This leads to a shorter heat cycle since the timer is starting earlier. Instead of starting 10 minutes after the burner fires up, maybe it's starting 5 minutes after, which has the effect of shortening the cycle. If this is true, I could either turn up the day heat and the evening heat as necessary to extend the cycles, or I could adjust the heat system sensor to a higher threshold, to force longer heat cycles. 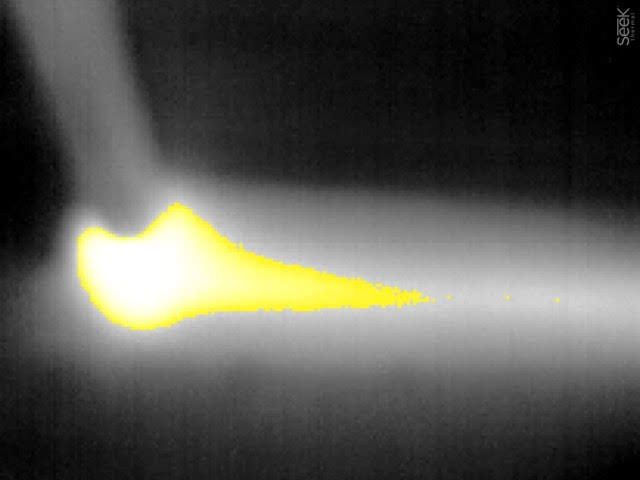 Until this morning, we had the heat system sensor set at x + 4 dots. It's now set at y to give the boiler more time before starting the cycle. It was just a guess so that people will be warm enough for now. I'd like to be more precise in choosing a setting. From what I remember, we're supposed to set the heat system sensor by timing how long it takes for the farthest radiator to heat up. We've done this before. My guess is that we need to do this again, but I'm worried that if we do it with a completely cold start, we'll get a setting that it will be too sensitive to the current situation, with an insulated return. Or maybe my theory is bogus and there is another issue? All of which neatly illustrates why, in a nutshell, I dislike using an irrelevant parameter (time, or a warm return) to control the output of a boiler. However, lots of people do it that way, so I'll keep (sort of) quiet. I suspect, @eappleton ,that you are on the right track, though -- the insulation does have the effect of allowing the condensate to stay warmer, and thus tricks the system into thinking that heat is established (which, in a sense, it is, of course -- just not enough of it). The approach you mention -- timing when the heat gets to the slowest (not necessarily the farthest in terms of distance) -- is what is going to be needed. Going to take some fiddling to get it right, though. I'm not sure how to figure out the best settings other than trial and error. And what would be the alternative to a heat system sensor? Thermostats in a few apartments? Yeah, that's the way I'd go -- there are thermostats which will accept multiple remote sensors and average them. Then to control the boiler -- if it's too big -- I'd use pressure, which is a direct measure of whether the radiation has enough steam or not. If it's much too big, I'd add a fixed timer to cut its average output to something closer to system demand. The best spot for the "heat established" control is at the farthest radiator if you can get there , 2d choice would be at the end of the farthest main returns would be my last choice. Yeah, the system sensor is at the end of the farthest main return in the basement. One side effect of the insulated return with the sensor is that new heat cycles are delayed and I need to make the heat cycles longer to compensate. This doesn't necessarily seem like a bad thing, since we now have fewer, longer heating cycles where the boiler is running on low-fire most of the time. There might more fluctuation in ambient temperature upstairs, but it seems that it would be more efficient in the long term to have longer cycles than a bunch of cycles with a high-fire start. - The water level is still dropping down below the coil. Our water level is much more stable than it was before the leak was repaired, but we did lose an inch in the gauge (7.5 gallons by the meter). Maybe this is below the coil? 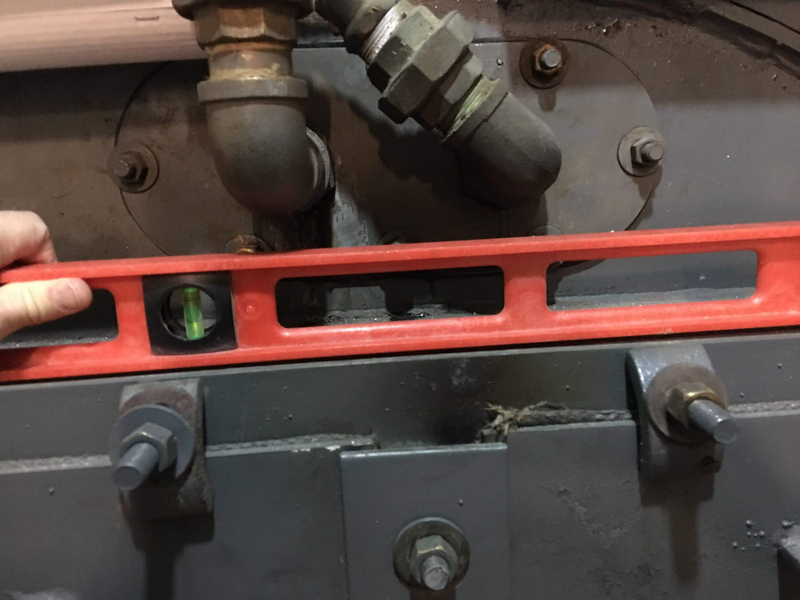 (The technician told me the coil dips a bit where it enters the boiler, and he eyeballed a level we should use but I don't know exactly where the top of the coil is. I tried looking at the specs for the Federal FST-40, but didn't see a measurement for these pipes.). I filled the water back to the level the technician indicated today. If the water temperature is more stable after filling, maybe it's a water level issue? The water has dropped about an inch. The water line after it dropped was at the top of the level. - The mixing valve isn't working. The temperature has fluctuated between 140 (when the steam is up and immediately after) and much lower temperatures. If the water level doesn't stabilize the temperature, then the mixing valve must be bad? By the way, a plumber was in the basement and told us that this new drain valve installed on our new condensate return is a gas valve. He said it isn't a big deal and should be fine, but isn't the right kind of valve. True?